For his latest contribution to his CDT series, cartoonist Crazy Crab of Hexie Farm finds inspiration in the wood-block print The Great Wave off Kanagawa by Japanese artist Hokusai. Responding both to the recent Beijing floods and the riots over a planned pipeline in Qidong, Jiangsu, Crazy Crab portrays the voices of the Chinese people as a huge wave. In this cartoon, past, current and future leaders of the Chinese Communist Party (Xi Jinping, Hu Jintao, Jiang Zemin, Deng Xiaopeng, Mao Zedong) are sitting in a dragon boat. 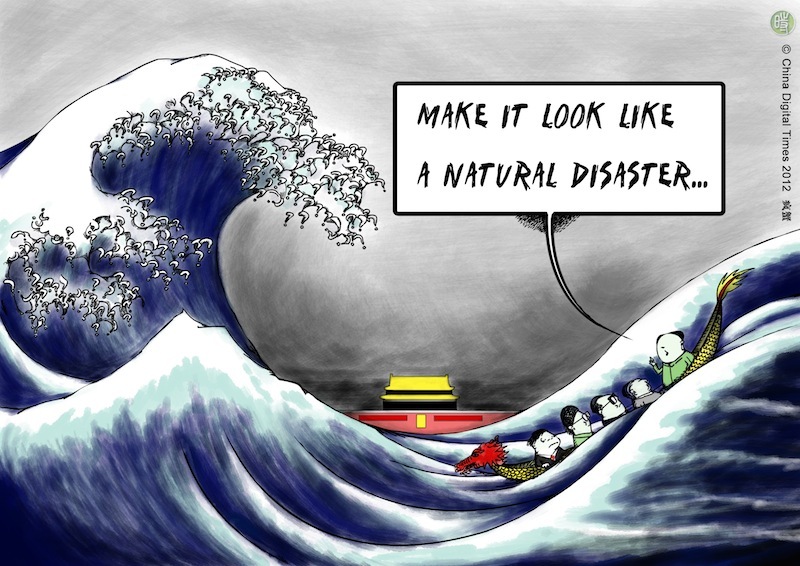 The caption from Chairman Mao refers to the Beijing government’s declaration that the 7.21 flood was a natural disaster. (In the past, the CCP also regarded the Great Chinese Famine as a natural disaster.) However, in Crazy Crab’s words, in the Internet age, a regime which depends on lying and propaganda is under the shadow of netizens’ voices. The Great Wave Off Zhongnanhai, by Crazy Crab of Hexie Farm for CDT. Read more about Hexie Farm’s CDT series, including a Q&A with the anonymous cartoonist, and see all cartoons so far in the series.